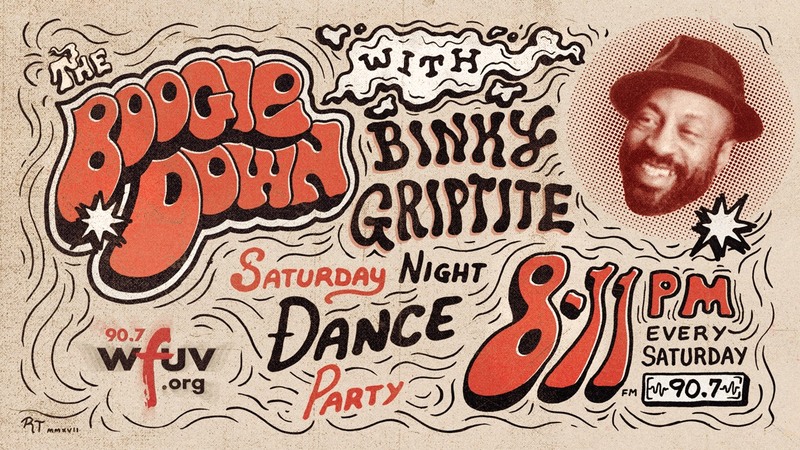 The Boogie Down is a party on your radio! Like the rest of FUV, this isn't some algorithm picking tunes at random — WFUV doesn't get down like that. FUV welcomes Dap-King guitarist and emcee Binky Griptite to the team as host of the Saturday night dance party at 8 tonight. Binky is known as a soul man, but has varied tastes you'll hear on the show. Soul and funk are the common threads that run through all the music. Expect horns and organs, but also banjos and rock guitars (every once in a while) too. As the newly minted DJ himself says, "I'm really interested in helping the soul bands that are coming up now. I'll play their records right next to the classic hits and the rare grooves, that's how we'll keep real music alive, by spreading the word about the bands and labels that are doing good work." The show will be active on social media platforms, reaching not just New York but around the world. After 20 years of touring with the Dap-Kings, Binky has fans in far-flung places. He wants The Boogie Down to be a beacon in the soul music world. "[FUV Program Director] Rita Houston has been so supportive of the band, and now of me as I take this long-awaited step," Binky adds. "I'm really glad to make my radio debut on FUV."